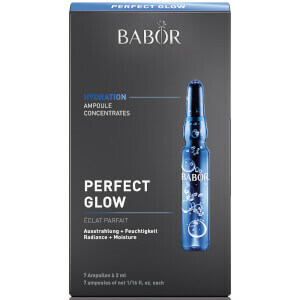 Combat blemishes and skin irritations with the Active Purifier Ampoules from Germany’s leading professional skincare label, BABOR; a set of seven individually sealed ampoules containing an advanced active concentrate that reduces the severity of breakouts. Innovative, fast-absorbing and highly effective, each serum-based ampoule contains an antibacterial blend of Shale Oil Sulfonate, Tea Tree Oil and anti-spot actives to deep clean congested pores, minimizing inflammation of problematic skin. The complexion is left looking visibly clarified and skin has a refined and revitalized appearance.